Dr. Jim Hrisoulas aka "Atar" is the author of several books, numerous magazine articles and research papers on the subject of bladesmithing and period metal working techniques used throughout history. His work has won awards at most of the internationally acclaimed knife and custom blade shows in the world. A recognized authority on metalworking techniques, Jim tries to share as much knowledge as he can with others and help out those who are having problems or who are in need of information. As Jim has said many times: "There are no secrets to doing this, it is after all "Dark Age Tech". His books are now considered to be "standard works" in the bladesmithing field. Jim sums up his "freedom of information" attitude pretty well with this statement "No one is born knowing how to do this, everyone has to start someplace". Over the years he has had his work displayed world wide in collections and museums, including the Tower of London and the New York Met. A Doctoral Degree holder in the field of Metallography, he understands the working techniques, applications and heat treating of steels and alloys to a very high degree. Jim has been referred to numerous times as one the "Grand Old Men" of knifemaking as well as one of the last of the "Old School Bladesmiths". It has been mentioned that he has been one of the "Top 10 Most Influential Bladesmiths of the last 50 years" on many occasions. Form follows function and you will find that there are no "fantasy" pieces nor anything that "doesn't work" on any blade that Jim makes. You can find a more decorative sword or a more elaborate dagger, but you will be hard pressed to find a better one where it counts, and that is in use. I had my hand surgery on Monday, June 8th, 2016 and none too soon..for what I have been told..I was running a temp in excess of 104.5 F..NOT a good thing to have two days prior to surgery, but be that as it may..they took me in after my wife called them and rushed my old self into the O.R. and then the fun started.. They threw the idea of a local out the window....The Dr. said that what he had to to do needed to be done NOW and done under a general anesthetic (OK my BP at check in was like 57 /30...whatever that means..the intake nurse asked me how I could be up and walking around and all.. but what do I know??? 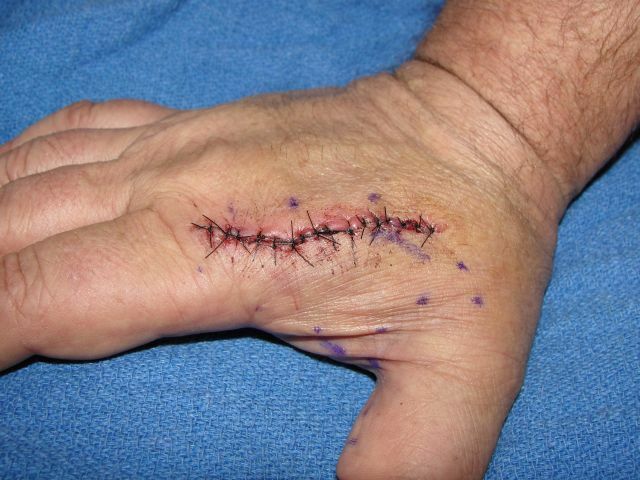 I am just lil ol me..).....It was a wee bit more complicated than what I was told and they were not able to take WIP pics but here's the aftermath 3 days after..now I can't really count the number of sutures..the suture line is about 3" in length. The thing was decent sized as well..about 3 1/4" wide by 5" long and a good 3/4" thick...much bigger than I expected...Had to get put under instead of using a local like we originally planned... Anyways.. Pretty groovy eh?? Guess my career as a hand model has come to an end..Sigh..Looks like I will be swinging a hammer for the duration from here on..